The first Award went to the staff, residents and management of the Streetlight Orphanage in Tacloban, including founder Erlend Johannessen. "We were on the roof, all of us, five-meter waves pounding our walls, building shaking, 300 kilometer winds, and we were just holding on for our dear lives. But my kids are so, so brave. My staff is so amazing. They really showed true Filipino spirit. They refused to give up. They were holding onto each other. Even if they were not their own kids, they held them as if they were their own kids," Johannessen said. TACLOBAN, Philippines, Nov. 20, 2013 (SEND2PRESS NEWSWIRE) — Several individuals and groups who exemplified great valor in the face of unimaginable tragedy during Typhoon Yolanda (Haiyan) have been honored by receiving the Adelina Award, the most prestigious prize in the Philippines awarded for humanitarian relief efforts, according to Lydia Ramos and Sarah Mendel of the World Mind Network and Friends Beyond Borders, who chair the Awards Committee. The first Award went to the staff, residents and management of the Streetlight Orphanage in Tacloban, including founder Erlend Johannessen. “We were on the roof, all of us, five-meter waves pounding our walls, building shaking, 300 kilometer winds, and we were just holding on for our dear lives. But my kids are so, so brave. My staff is so amazing. They really showed true Filipino spirit. They refused to give up. They were holding onto each other. Even if they were not their own kids, they held them as if they were their own kids,” Johannessen said. Another recipient is the medical team from Mammoth Medical Missions in California, which stationed a group of 16 doctors and support staff in the ruined Town Hall of Tanauan, 30 kilometers south of Tacloban. Working under wartime conditions with no power, running water, or sufficient supplies, they performed more than 100 surgeries, including amputations and C-sections, in three days soon after the typhoon. 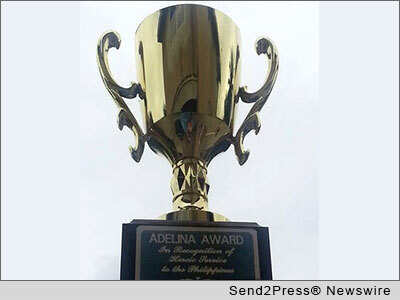 Medala moms is a group of Filipinas who were honored with an Adelina Award for donating breast milk to desperate mothers of infants in the typhoon zone. They work in cooperation with the Philippine General Hospital Milk Bank which uses the latest technology to preserve the breast milk and transport it to calamity-stricken areas. British engineer Jonathan Fitzpatrick won the Award for his heroic actions in saving dozens of people trapped in the Ormoc Villa Hotel on the morning the typhoon made landfall with 170 mph winds. He and his colleagues kicked in blocked doors, shuttled people to relatively safe stairwells, and provided water until the wind subsided. According to his family, he at first thought he and the others were going to die, but decided that if he was going to perish, he would do so while fighting. Rex Raymond Torrecampo from Batangas, Philippines, won the prize for his brilliant analysis of the tragedy which appeared on his blog LifeSoMundane. He pointed out that much misery can be avoided during disasters like typhoons for which the storm path is fairly predictable well beforehand, by storing relief supplies close to, but just outside of the estimated storm track. Dr. Joji Tomioka and his team of 26 doctors and support staff from Japan won the Adelina Award for their ground-breaking use of new technology in the field. They deployed wireless mobile X-ray units, developed after the devastating tsunami which hit Fukushima, Japan in 2011. A small camera scans the patient, and its information is sent to an iPad and thence to a laptop. Using typical thumb and forefinger iPad gestures, doctors can zero in on an image to see exactly where a lesion or bone break might be. The Japanese team is currently seeing about 200 patients a day. NASA and the Italian Space Agency won an Award for work performed by their ARIA (Advanced Rapid Imaging and Analysis) team. They produced a space-based map of the Tacloban region which helps disaster relief authorities by depicting minute surface changes in the terrain caused by natural or human-produced damage. For more information go to http://philippinetyphoonrelief.net/. To help typhoon victims, go to http://www.redcross.org.ph/.